Top and Above To improve mission flexibility, the SR-71’s nose section is detachable, enabling the aircraft to be fitted with a ground mapping radar unit or a 30 inch Optical Bar Camera (OBC) for horizon-to-horizon panoramic scanning. (Paul Crickmore). resolution of 6 inches from operating altitude. 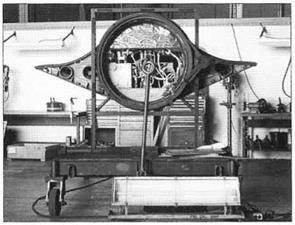 The engine to be used was the Marquardt RJ43 – MA-3 Bomarc, and by October 1963, the overall configuration for the QM2 and its launch platforms – two purpose-built, modified A – 12s – were nearing completion. Code-named ‘Tagboard,’ the designation of both elements was also changed, the carrier vehicle became the ‘M’ – standing for “Mother” – 21 and the 12 became the ‘D – for “Daughter” – 21.
flight came to an end after a hydraulic pump burned out and the D-21 fell out of the sky. 30 July 1966 and ended in disaster when the drone collided with ‘941 moments after achieving launch separa­tion. The impact caused the mother craft to pitch up so violently that the fuselage forebody broke off. Both Bill Park and his LCO Ray Torick successfully ejected and made a ‘feet wet’ landing, but unfortunately Torick’s pressure suit filled with water and he drowned before he could be rescued. Bill Park spent an hour in the ocean before he was brought aboard a US Navy vessel. underwing pylons of two modified B-52Hs of the 4200th Test Wing based at Beale AFB. Upon launch the D-21B was accelerated to Mach 3.3 and 80,000ft by a solid propellant rocket developed by Lockheed Propulsion Company of Redlands, California. On achieving cruise speed and altitude the booster was jettisoned and the drone’s flight continued as described earlier. The first launch attempt from a BUFF was made on 6 November 1967; this proved unsuccessful, as did three other attempts. Success was finally achieved on 16 June 1968. Between 9 November 1969 and 20 March 1971, a total of four operational flights over China were attempted. To maintain tight security the B-52, hauling its unique payload, departed Beale at night and lumbered westwards to the Pacific Island of Guam. Just before dawn the next day the flight resumed, the bomber departing Guam and heading for the launch point. Upon vehicle separation, the Buff made its way back to Guam, while the D-21 embarked upon its pre-programmed day-time reconnais­sance run. Achieving only limited success, Senior Bowl was cancelled on 15 July 1971. 1963, Lockheed received pre-contractual authority to build six aircraft, with the understanding that 25 aircraft would be ordered by 1 July. 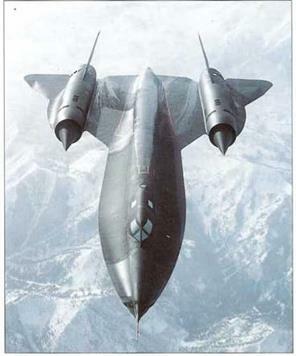 Col Leo Geary had been the RS-12’s Weapon System Program Officer, but after protracted debate, it was decided that the A-12 project group under Col. Templeton, would inherit the R-12, which became designated SR-71 by the Air Force. The RS-12 and later the B-12/B71 proposals for a strike – version of the aircraft would fail to win production contracts, despite Kelly having demonstrated to the Air Force the unique capabilities of such a platform. This was largely due to the far greater lobbying powers of the XB-70 anil later the l’B-111 fraternity. During a speech made on 24 July 1964, President Johnson revealed to the world the existence of the SR-71. 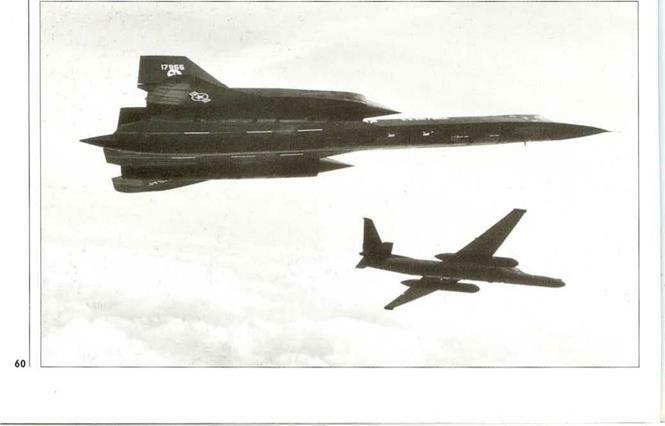 ic Robert I Gilliland to the position of chief project pilot for the SR-71, a post for which Bob was admirably quali­fied, having gained a great deal of experience as a member of the F-104 and A-12 test teams. Below SR-71 17955 was operated extensively by Air Force Logistics Command from Plant 42. Palmdale and was dedicated SR-71 test aircraft. 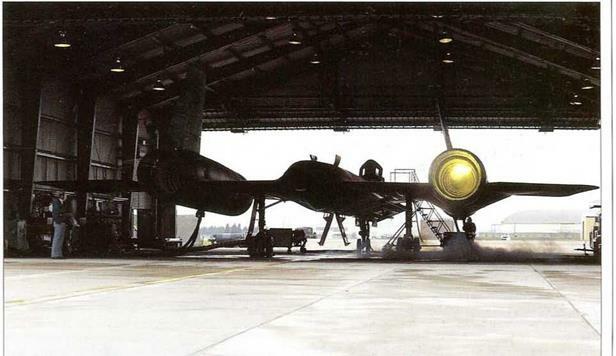 It is seen here in company with a U-2R. believed would be reached before the aircraft became vulnerable to interception). Aircraft 951 and 952 were added to the test fleet for contractor development of payload systems and tech­niques and shortly after the phase II, Developmental Test Programme was started, four other Lockheed test pilots were brought into the project: Jim Eastham, Bill Weaver, Art Peterson and Darrell Greenamyer. Developmental efforts within Lockheed were matched b Air Force Systems Command (AFSC) where Col Ben Beilis had been appointed the SR-71 System Programme Officer (SPO). His task was to structure a ‘Development and Evaluation Programme’ that would evaluate the new aircraft for the Air Force, a program undertaken by the SR-71/YF12 Test Force, located at the Air Force Flight Test Centre, Edwards AFB. 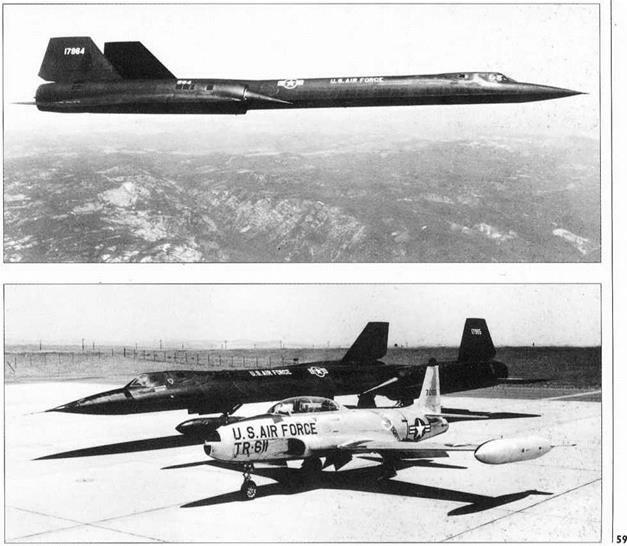 Both Phase 1 ‘Experimental’ and phase II ‘Development’ test flying had moved to Edwards where SR-71As 953, 954, and 955 were to be used by the ‘blue suiters’. 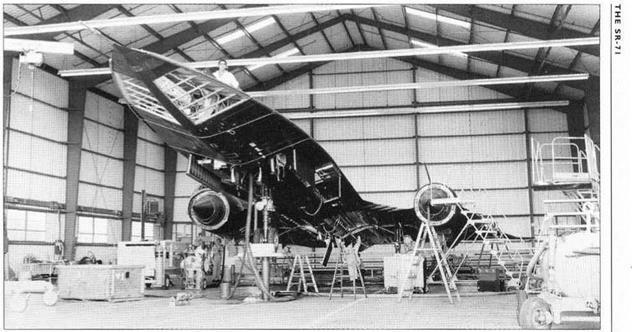 However, the SR-71s were plagued by problems associated with the electrical system, tank sealing and difficulties in obtaining design range. Whilst these problems were being worked at, Beale AFB, chosen home for the newcomer, had been undergo­ing an S8.4 million construction program which included the installation of an army of specialised technical support facilities. 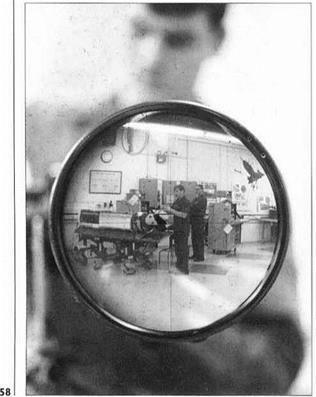 The 4200th Strategic Reconnaissance Wing was activated at Beale on 1 January 1965 and three months later, four support squadrons were formed. In Januarx 1966, Col Doug Nelson was appointed commander of the new x ing – a job for which he was eminently qualified, having been the Director of Operations for the Oxcart project. Doug began by selecting a small group of highly competent sub-commanders and Strategic Air Command (SAC) fliers to form the initial cadre of the SR-71 unit. 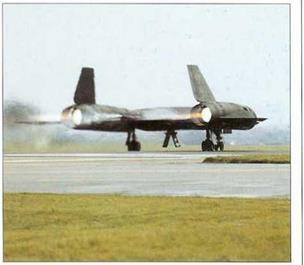 Below With both ‘burners’ engaged, SR-71 A serial 17960, call­sign TRULY55 starts to roll down RAF Mildenhall’s runway. Above Standard operating procedures call for the SR-71 to get airborne with a light fuel load, enabling it to land back immedi­ately should a problem develop. Once airborne, the first order of business is to ‘hook-up’ with the tanker and top-off with fuel. Col Bill Hayes became the deputy commander lor main­tenance, Lt Col Ray Haupt, Chief Instructor Pilot, Col Walt W right commanded the Medical Group, Col Clyde Deaniston supervised all category III flight test planning and the flight crews were recruited from the best SAC bomber pilots and navigators in the service. The first two of eight Northrop T-38 Talons arrived at Beale on 7 July 1965, to be used as ‘companion trainers’ to maintain overall flying proficiency for the SR-71 crew at a fraction of the cost of flying the main aircraft. On 7 January 1966, Col Doug Nelson and his Chief Instructor, Lt Col Ray Haupt delivered the first SR-7 IB to Beale AFB. Five months later, on 14 April, Nelson and Maj A1 Pennington took delivery of Beale’s first SR – 71A, serial 64-17958. On 25 June 1966, the 4200th was redesignated the 9th Strategic Reconnaissance Wing (SRW) its component flying squadrons being the 1st and 99th Strategic Reconnaissance Squadrons (SRS). Crew training and Category III Operational Testing then proceeded in earnest.